"How do I get my child to read?" “My child rarely picks up a book." "If it’s not technology based, my child is not interested!" "My child used to read all the time but not anymore." If you’ve ever said any of these things, you’re not alone. These days, children’s attention is pulled in so many directions—school, extra-curricular activities, appointments, video games, and social media. Getting your kids to pick up a book can be a challenge. There’s also research that suggests that reading motivation declines as soon as reading becomes a forced activity. That means that losing the motivation to read can happen very early in a child’s life. While this might sound discouraging, it doesn’t have to be: the research gives us important clues about how we can best help children develop positive reading habits. As much as possible, reading should remain intrinsically motivated, which means the emphasis should be placed on enjoying a plot twist or spending time reading together, rather than dangling a tangible reward. For parents, the key is to create an environment and conditions that promote reading as an enjoyable activity. If you would like to encourage your child to read more, there are several simple strategies you can try. Children are likely to engage in an activity when they are able to predict its frequency and are aware of the expectations. They like it even more when they can hold their adults accountable as well! Does your child see you reading? Do you consistently carve out time to read and if so, how often? Is reading a priority for you? Now is as good a time as any to take stock of your own preferences, habits, and feelings toward reading. We're all creatures of habit, and it’s never too late to start a new one—although it does take approximately 21 days for a new habit to stick. Put reading time on the calendar. Find a time and frequency that you can manage without interruption (bath time, the bus ride home, while waiting for siblings, breakfast, bedtime). Be flexible. 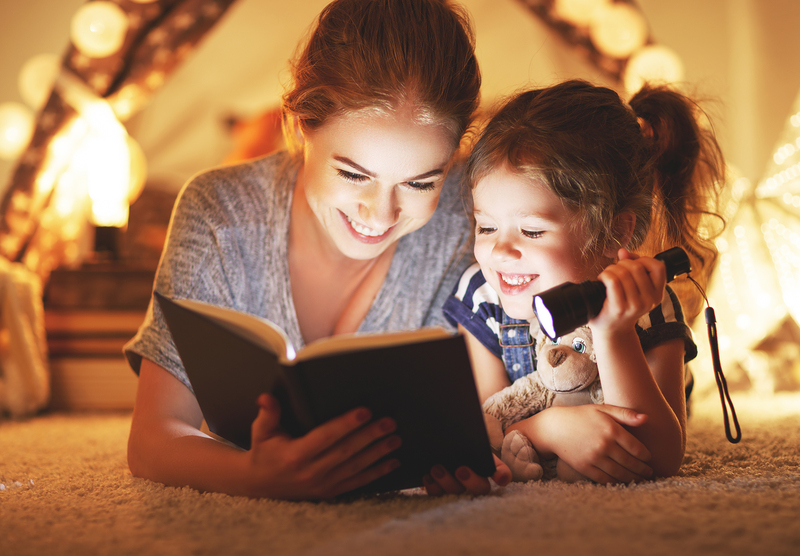 Reading can happen anywhere through a variety of modes and resources—magazines, books, newspapers, comic strips, Kindle and other e-readers, Audible, and websites such as Tales2go, Epic, Reading A to Z, and Learning Ally. Be realistic. We're busy and life "happens." Start with a small goal, maybe 15 minutes, two times a week and add on from there. You might also have to set some limits on other activities—like video games or TV. Read as a family. Choose a book the whole family will read (start a family book club) or set aside a time when everyone in the family reads their own material at the same time. Make it fun! Gone are the days where reading has to be a quiet activity! Interactive (reading and discussing at the same time) and shared reading (I read to you, you read to me) are great ways to immerse your student in reading while having fun! P.S. Your child is not too old to be read to! No matter what age, there is always something to be gained by listening to a story. 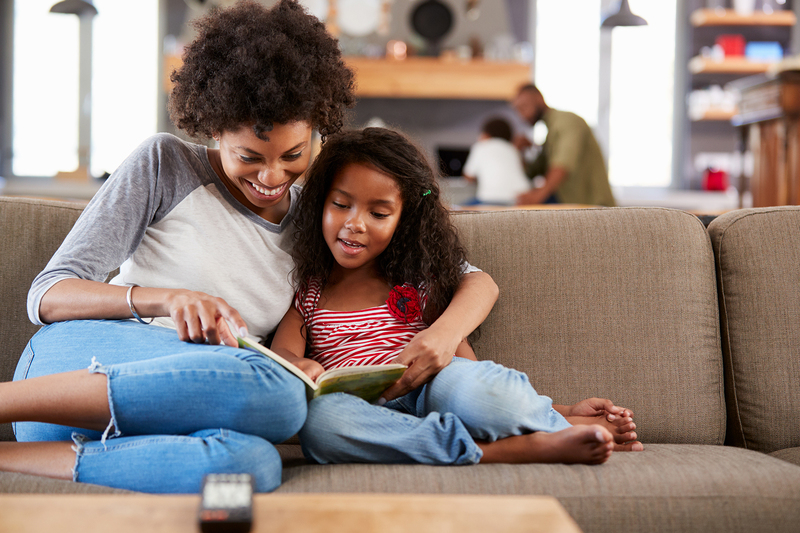 Reading to your child is a bonding experience that can continue indefinitely regardless of age. It is important for children to hear fluent readers read, especially if fluency (reading smoothly and accurately, paying attention to punctuation) is a skill your child is still working on. Pressed for time? Try mixing it up! Listening to audiobooks is a good way to further your child’s literacy and can be done the go. There are plenty of audiobook titles the whole family will enjoy! Where did your interests, priorities, likes, dislikes, and deeply held beliefs originate? Most of us would look to those who raised us because preferences, habits, and expectations are often passed down. If children see their adults working hard, they, too, are likely to work hard. Attitudes toward reading are no different. Therefore, it is important to present children with a genuine, positive outlook on reading by demonstrating a positive attitude and behavior toward the reading materials we choose for ourselves. How do you make your enjoyment of reading visible? Let your child see you reading for pleasure. Some professionals have to read for work, and that's important to acknowledge. However, right now, the focus should be on creating an enjoyable habit. Do you have a favorite reading spot? Encourage children to find/create their own! Talk positively about reading. Express that reading is something you look forward to. Casually bring up what you're reading just like you would the latest episode of your favorite TV show or podcast. Be excited and authentic when discussing what you are reading. Share what drew you to your book. Favorite author? Great cover? Interesting topic? Personal connections? What else can we talk about? Ask an open-ended question that encourages your children to think about what they've heard or read. Open-ended questions do not have yes or no answer; in fact they often have many possible answers! Here are some examples: Is this fair? Was this a good decision? How would you have responded if you were in that situation? What does this (scene, plot twist, setting, story) remind you of? Have you ever asked yourself why you have to read the same story to your child 1,908 times? Because they have bought into the idea of reading—albeit one particular book at a time. Fear not, there actually are benefits to repeated readings (but that's another blog post!). Part of engaging children in a new routine is capitalizing on your children’s interests and the easiest, cheapest, least forced, most enjoyable way to do this is, is to let them read what interests them most. Engagement and motivation increase when children have the ability to choose what they read. Take trips to the library or local bookstore. Introduce other books by the same other or other books in the series. Challenge your student to read as many books as they can on the same topic and compare the facts learned. It’s important to notice patterns. If you notice your child is actively avoiding reading, that is cause for concern and worthy of a conversation with teachers to determine what the next best steps may look like. Remember, it takes 21 days to build a habit. Model genuine interest and pleasure in reading but don't force it. Take small manageable, realistic steps. Value the time you spend as a family reading together. Jamie Weng earned her undergraduate degree and MAT from American University and is currently pursuing her MEd in Literacy Leadership within Diverse Schools. She has been educating DC students in PreK through 5th grade since 2002 and joined the Lowell faculty in 2016.